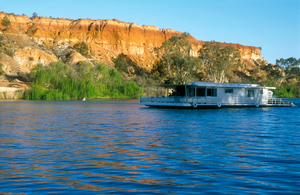 A Murray River Houseboat passing ancient cliffs at sunset, just upstream from Renmark, SA. 2002. Photographer : Greg Rinder on September 06 2002.